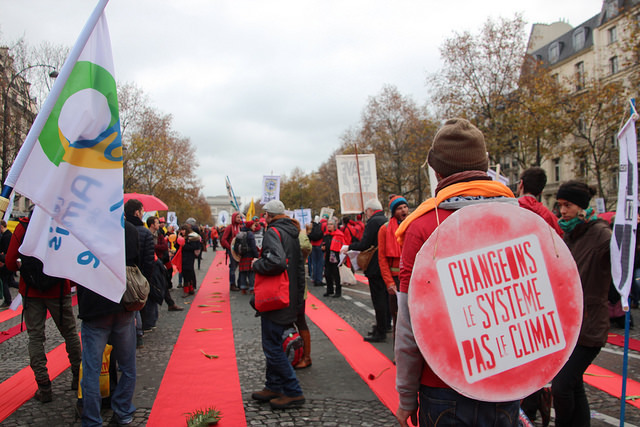 Even though the State of Emergency which prohibits large political protests is still in place, tens of thousands turned out on the streets of Paris for climate justice in various creative protests. The French state on Friday, relented, and allowed the protest to go ahead. For two weeks activists had been planning a day for redlines for the climate emergency, to defy the state crackdown on the right to freedom of speech and assembly. Organisers had embarked on civil disobedience training of thousands of people at the Climate Action Zone in preparation for the day. The Climate emergency, it was argued, was far more important than the security restrictions imposed by the State of Emergency to protect citizens. 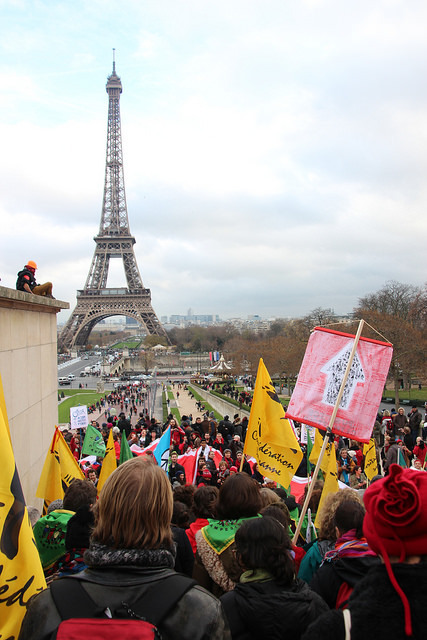 Coalition organisers, Climate 21, estimated 30,000 people participated in a rally and march from the Arc de Triumphe via the Trocadero to the Eiffel Tower. Just after 4pm organisers at the other event in Champs de Mars say 20,000 people were in attendance. As a visitor to France it was one helluva way to see and visit some of the iconic sites of Paris, with 30,000 other people as my tour guides. On the metro the train was packed with people on the way to the protest. Squeeze a little more with every station stop to allow more to join. We arrived at the Arc de Triumphe just in time to see the bike bloc turn up and go round the Arc de Triumphe. What a sight. Like Melbourne’s critical mass with a multitude of hand crafted signs and flags on colourful bikes and people. A choir entertained with songs opposite the Arc de Triumphe. For some reason the police would not let us go down the avenue. We had to walk down another avenue and then the side street to join the protest. There were the solemn moments of unravelling the giant red ribbons along the avenue de la Grande Armée, laying them on the ground, and red tulips on top for the people already killed due to climate impacts and the many more to die in coming years. The particles, giant air filled cubes, bounced up and down the crowd like a wave along the avenue. There were marching bands, colourful banners and signs. The chants as we marched and songs. 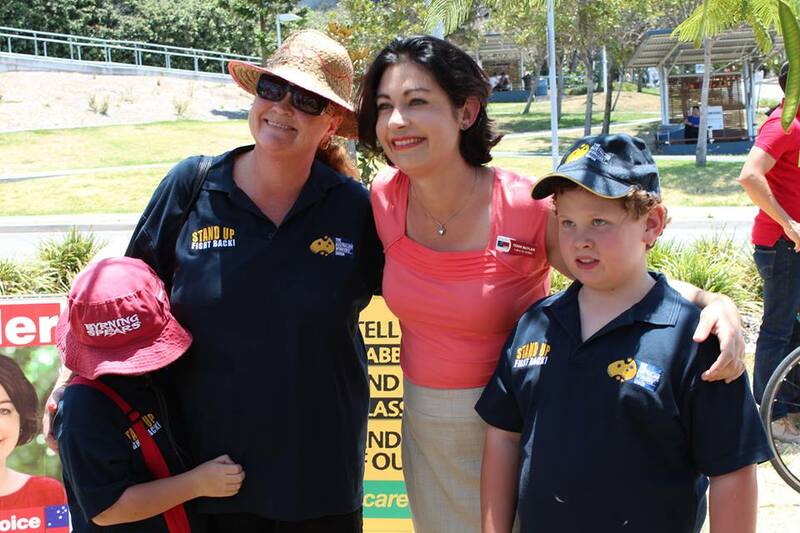 I have come to the conclusion we don’t get nearly enough songs on our marches in Australia. The Climate Guardian angels, with red in their feathered wings, were at the front, facing the line of riot police. They brought a solemnity and grace to the proceedings. 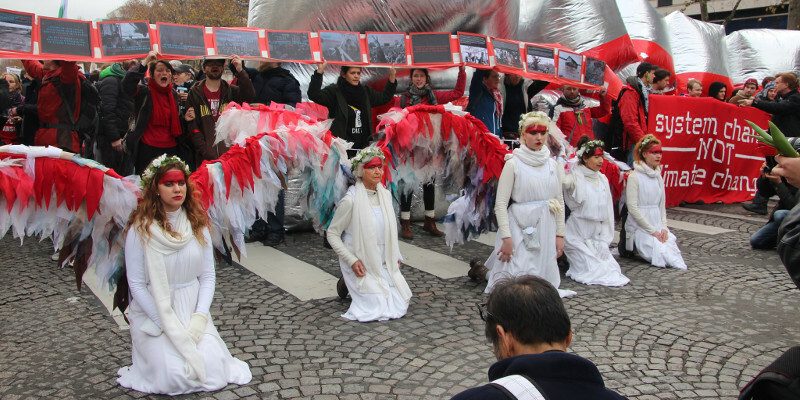 The Australian climate angels have entertained and intrigued Paris in their numerous appearances at iconic sites, events and protests over the last two weeks. They brought messages from the children of Australia on climate change, challenged politicians and diplomats outside at the start of the climate conference, intervened between CRS riot police and protestors when tensions were building. 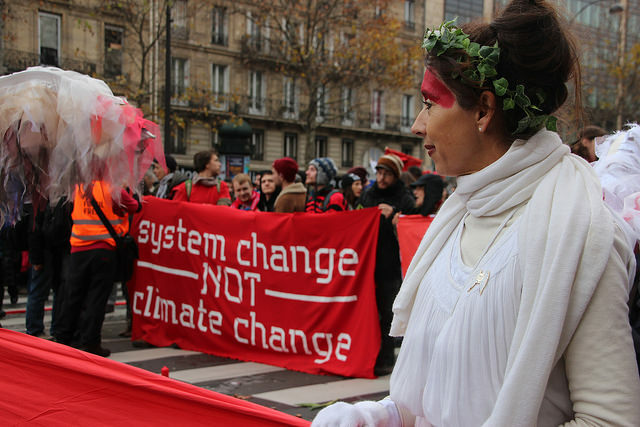 The combination of sense of theatre, art, and protest has brought a solemnity and grace to the climate justice movement in Paris. The clown bloc was also on hand to diffuse any tension between police and protestors. The riot police were pretty adamant we were not to go towards La Defense, the business district where many corporates have their headquarters. The climate angels and clowns served to dampen the tensions and as the march left we were squeezed down one of the streets to the left. The view of the Eiffel Tower as we came down from the Trocadero was amazing. It must have lifted the hearts of those people forming human chains already at the Champ de Mars event. As we crossed the River Seine at the Pont d’Ilena the climate angels and the front of the march conducted a sit-in on the bridge. 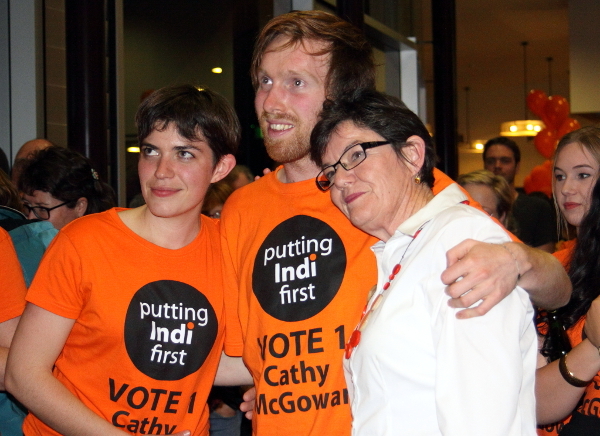 There were a few speeches through mic-check. It was more about: this is our road, our space, our time, for climate justice. Move us if you dare. Of course the Eiffel Tower, even in December, is an icon for tourists. Batoning and teargassing people sitting down would not be very good publicity. People around the edges drifted by to the other event, or to the kiosks to buy food or drink. Riot police stood around looking somewhat bored, checking out their phone messages. One of the problems was a police cordon that seperated the marchers from the Arc de Triumphe from the rally in the Champ de Mars, with bag checks necessary to filter from one to the other. Many of the marchers just didn’t progress to the rally at Champ de Mars. Eventually the sit-in on the bridge ended, with people voting to move under the Eiffel tower. The mood was festive, with singing and dancing. In the early morning hours, representatives from Indigenous nations of Circumpolar, Amazon, South Pacific and North America joined for a sunrise ceremony prayer at the foot of the historic Notre Dame Cathedral, on the Saturday morning. The ceremony was disrupted by Paris Police who came to the square and begun to remove banners. Other protests on the Saturday included co-ordinating about 3000 activists to visit a certain spot at a certain time with mobile phone geolocation service turned on to spell a message. So the presence of these people were mapped in Paris at the organised time to spell out the words ‘Climate Justice’ and ‘Peace’. Friends of the Earth organised this to circumvent the State of Emergency prohibition on large gatherings and marches. On the Friday Greenpeace had used a truck with organic water soluble paint to spill yellow on the road around the Arc de Triumphe, turning it for a time into a giant yellow sun with rays down the avenues. “We’re in a race between rising temperatures and the roll-out of renewables, and if renewables win that race then whatever is agreed at the Paris talks, we’ll beat dangerous climate change. 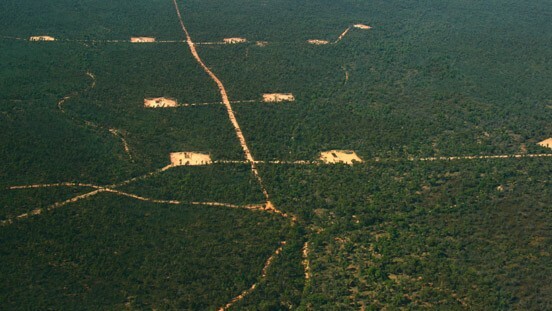 We need to see the end of the fossil fuel era and the birth of a renewable-powered world.” said Amiel. Half a world away in the high security bubble of the UN climate Conference at Le Bourget, about 12 kilometres from the protest, the final draft text to the Paris agreement was issued for negotiators to pour over and see what needed to be decided upon, what compromises needed to be made to bring an agreement to fruition. The Ministers were due to convene later that afternoon and evening to pull it all together. But the day really belonged to the people in the streets of Paris. This was their day of marching for climate justice, with or without official approval under the state of emergency. While the world marched peacefully on the weekend of November 27-29, with 2300 events in 175 countries and more than 785,000 people including over 100,000 people in Australia, Paris was unable to march with the world that weekend due to the State of Emergency, although creative protests ocurred with 20,000 shoes placed symbolically in Place de la Republique, and a human chain along Boulevard Voltaire attracting up to 10,000 people. December 12 was the Paris moment for climate justice, it was their day articulating that we are all under a climate emergency, and any UN agreement will not go nearly far enough. That we will need to push governments and business much harder in coming months and years. As my new T-shirt from Amis de la Terre says: “Changeons le systeme, pas le climat”, we need to change the system not the climate. You can view my photographs of the rally and march in a Flickr album. 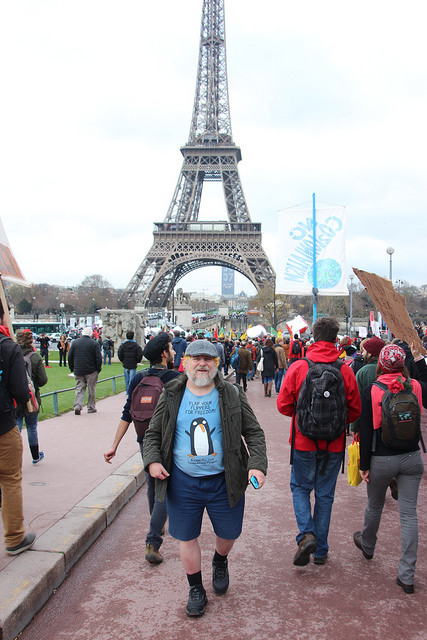 Filed Under: #auspol, #ClimateAction, #ClimateElection, #Columns, #COP21, #CurrentFibs, #PeoplesClimate, Activism, Citizen Journalists, Civil Disobedience, Climate Change, Freedom of Speech, Front Page, Issues, John Englart Tagged With: Paris, Protest.